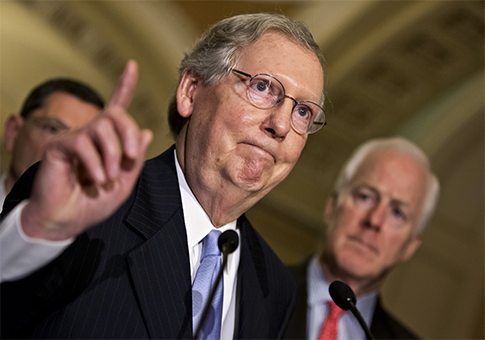 Senate Majority Leader Mitch McConnell (R., Ky.) accused the Obama administration of misleading Congress and hiding evidence in order to conceal the effort by the Internal Revenue Service to target conservative groups seeking tax-exempt status. The Hill reported that McConnell slammed the White House in a statement Wednesday following the release of a bipartisan Senate Finance Committee report that revealed the extent to which the "delinquent" IRS mismanaged applications from Tea Party groups. "The report makes clear that civic groups were harassed specifically because they identified as conservative," McConnell declared. "It underlines the seething contempt partisan officials like Lois Lerner had for them. It also reveals that administration officials continually misled Congress and attempted to hide evidence that might have brought the truth to light sooner." Among the 142-page report’s key findings, it concluded that Lois Lerner, former head of the government agency’s Exempt Organizations Unit, "failed to adequately manage" members of her staff processing the applications in question for two years beginning in 2010. "The Nixonian harassment of Americans with the gall to think differently than the president was outrageous enough when it first came to light," McConnell added of the IRS targeting, to which Lerner admitted in 2013. "It’s even more outrageous today." The release of the congressional report comes as multiple lawmakers demand that President Obama fire current IRS Commissioner John Koskinen for hindering the congressional investigation into the targeting scandal. Reps. Ron Desantis (R., Fla.) and Jim Jordan (R., Ohio), both members of the House Oversight and Government Reform Committee, wrote in a Wall Street Journal op-ed last week, "Commissioner Koskinen … has failed the American people by frustrating Congress’s attempts to ascertain the truth," threatening to pursue impeachment should Obama refuse to act. Chairman of the House committee Jason Chaffetz (R., Utah) authored a letter to Obama asking him to do the same by "work[ing] hand-in-hand with Congress to fix the problem." The IRS addressed the report in a statement Wednesday, alleging that it has "cooperated with Congress and other investigators." "We have already taken many steps to make improvements in our processes and procedures, and we are pleased to have other suggestions from the committee to help us in our continuing effort," the government agency said. McConnell insisted that "the time for forthright answers and an actual, serious plan from the Obama administration to prevent this from ever happening again is now." This entry was posted in Politics and tagged Barack Obama, IRS, Mitch McConnell, Tea Party. Bookmark the permalink.